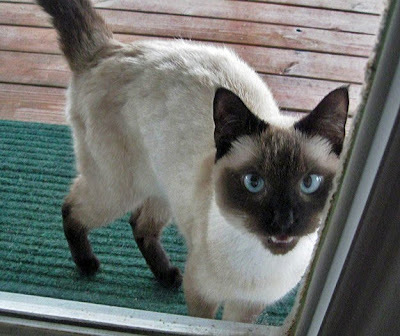 Daddy and Momma rescued a kitty this morning ... and of all kitties it was a Meezer!!! Daddy was watching TV and something caught his eye, and at first he thought it was Simon's reflection in the door. He got up and looked outside, and there was a seal point Meezer sitting on our glider on the deck ... it freaked Daddy out because he thought it was Simon, but none of us ever go outside and they are so careful that we don't even try to. 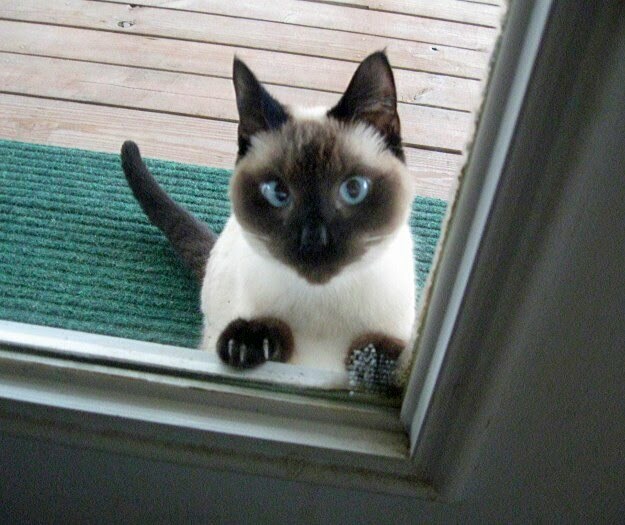 But Simon was sleeping under the blanket on the sofa, so Daddy went outside and sure enough, there was a beautiful, friendly and very loving male Meezer out there, probably about a year old, who gave Daddy and Momma head butts and made himself right at home on the deck. He was so loving that he even jumped up, grabbed onto Daddy's back pocket, hung there and stared at him like he was saying "please pick me up", which Daddy did. Momma put him in a carrier and called several places to see if anyone reported a missing Meezer, and one of the places she called is a no kill shelter called Paws Place, run by a married couple named Paul and Joyce here in Rocky Mount. 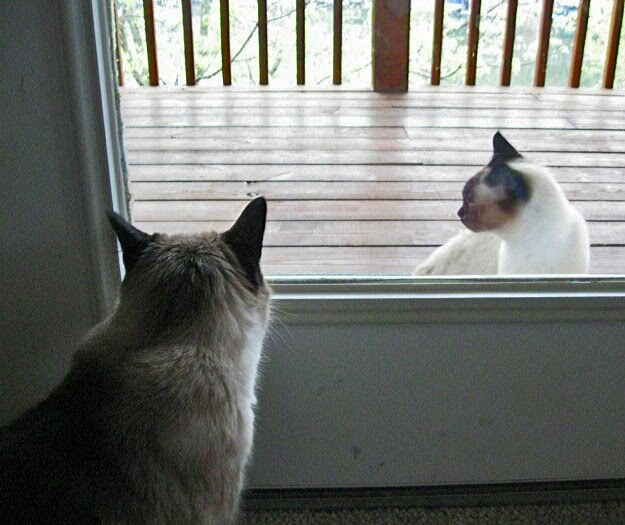 They did say that someone had reported a missing Meezer, and Joyce came to our house to pick him up. Hopefully, this is the missing Meezer, and if not they will adopt him out, or maybe even keep him, because Paul had a Meezer for 18 years who went to the Bridge, and she thinks maybe he will fall in love with him. The Meezer even gave Joyce love nibbles on her fingers when she was petting him in the carrier!!! But now that he is gone, Daddy and Momma were saying maybe they should have kept him since he could almost be Simon's twin, but they are really hoping this is the Meezer that was missing. We are especially thankful that he wasn't attacked by a hawk or a coyote before he showed up here since we live in a remote area, so all and all this has been a fantastic day! HURRAH!!! We are SO happy for the little Meezer guy. He does look a lot like Simon. Poor guy, he looks a little bit thin, we wonder how long he's been lost? Your Dad is a HERO! Oh, and your Mom is a HERO too! He was one smart meezer to find your house! He knew the right house to come to! What a cut guy! Being so friendly, we bet he just got lost from his home and we hope he is returned to it soon. We are so glad that meezer came to YOUR house. Thank Cod for your mom and dad! Do you think that big lighted sign that only cats can see that says "MEEZERS WELCOME" had anything to do with his showing up at your house???? We are so glad the meezer chose the right place to stop by and introduce himself. What a smart Meezer boy...he knew where to find a Meezer pile to join. Will you be able to find out how it all turns out? We were kinda hoping you'd now be a family of 4!!! Oh that is so wonderful, Sabrina. Your Mom and Dad are wonderful. They take after you. We sure hope someone didn't dump him since you live in a remote area. We hope he's the lost kitty too. We hope he is the missing Meezer fer the sakes of those Beins. But if not, mebbe you could adopt him; he sure seemed ta like yer Mom and Dad! I hope he is reunited with his family soon! He looks like he has peoples who love him dearly. Thanks for looking out for him!